I am so very excited to tell ALL of my fellow PINNING addict homeschool friends about the launch of a great new site – Homeschool Parent Information Network - Homeschool PIN for short. 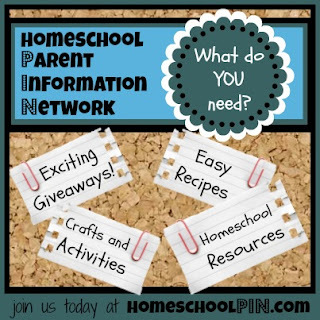 This new home education resource site uses a Pinterest-type setup to connect homeschool parents with thousands of great resources for curriculum, recipes, encouragement, crafts, and much more! The website is launching today and to kick it off there are several great GIVEAWAYS going on! One of them is from me and is for the Columbus And The Great Discovery DVD from Learn Our History. "If you’re like me, you’re always eager to find new ways for the kids to enjoy learning, without spending money. The Internet has a wealth of knowledge for us as homeschool parents, and quite a lot of it is FREE. But it can take time to locate, collect, and organize all this information. What I needed was a single Pinterest-type site where I could quickly and easily find all the home education resources I needed. It would be even better if those resources were efficiently organized and categorized for fast browsing. That’s what my new site, Homeschool Parent Information Network, provides. Not everyone is on Pinterest, and the internet is still the most searchable form for home school resources. I have designed Homeschool PIN as a massive resource site for moms, dads, tutors and teachers, and even kids; a single site where you can find just about anything imaginable having to do with the homeschool life. Homeschool PIN has been created to provide all the benefits of a Pinterest site, but one designed specifically for Homeschool families." Homeschool families often need crafts or activities to supplement their studies. At Homeschool PIN, you can find just what you need in the various craft and activity categories including a special "Crafts for Mom" category! Let’s say you need activities related to Autumn or Thanksgiving then just browse the "HOLIDAYS" – "Autumn/Fall" category, where you’ll find recipes, crafts, decorating ideas, and more. And that’s just the tip of the iceberg of what you’ll find on Homeschool Parent Information Network. But rather than keep talking about it, how about you just head on over and check out what Homeschool PIN has to offer for yourself! Oh and don't forget to enter the awesome GIVEAWAYS! -Homeschool PIN Facebook - tell Angela I sent you! *Disclaimer - I received two FREE listing on Homeschool PIN, a couple eBooks and a listing in websites you'll love category in return for helping them spread the word. Many of the links found on my side bars and in my blog posts are affiliate links. Please note that prices indicated in the post are subject to change. As a result, I might get paid money and I will most likely spend the money on homeschool supplies.